I used a Roco US military Jeep as a source for underframe and interior, scratch built the bin aft of the front fender and added wire grabs above and aside the doors to the passenger compartment. 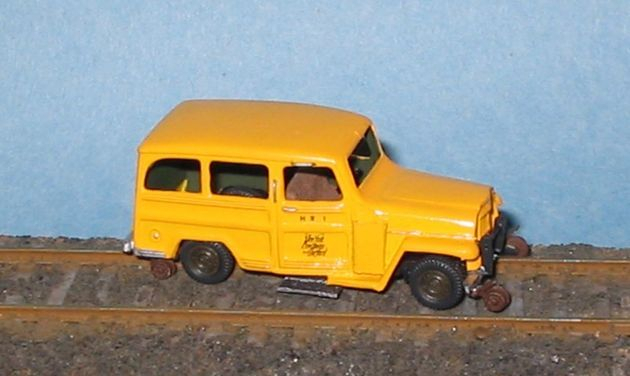 The Hi-Rail wheels are a Custom Finishing item and the script herald on the door is a Mircosale N-scale decal. Maintenance of Way equipment is a broad category more correctly known as Non-Revenue Equipment. All railroads require a variety of equipment that is not used in regular service (so does not earn revenue for the railroad, hence the category name) but is needed to maintain rail service and facilities in working order. Below you will find a variety of models I’ve built or bought as I build up my equipment roster. The New Haven Railroad referred to its trains that performed all sorts of work on the railroad system as Tool Trains. In the electrified region with overhead catenary there was one more specialized train called the Wire Train. The photo above represents the current status of my own efforts as I work on these models from time to time. The train is not yet accurate, but will become more so over time. Pictured above from left to right are; C-118, the Maybrook Tool Train Class NE caboose; a stand-in Walthers 36’ wood box car that will be replaced by either Funaro & Camerlengo or Westerfield models that are accurate; Water Car L-64 that provided fuel for the steam-powered Derrick; an MDC/Roundhouse/NHRHTA 40-foot steel gondola that will eventually be replaced by a Wheel Flat car; a stand-in model of 230T Derrick D-102 that was assigned to the New Haven’s Oak Point Yard represented by an Athearn 250T Derrick; Truck Flat F-127 built by Al Lawrence and now part of my collection, and at the front an Alco FA-1 as motive power. Probably the most recognized railroad Maintenance of Way equipment are Derricks and Snowplows. Derricks, Hoists and Cranes are most commonly associated with uprighting derailed equipment at train wrecks but performed other tasks from laying rail to putting steel girders in place for bridges. Snow Plows and Flangers were used to clear tracks in Winter months to keep the traffic moving in inclement weather and were seasonally used pieces of equipment. Railroads also moved freight that was priced by weight such as coal. Scales to weigh freight cars were located at several facilities and so Scale Test Cars for checking the accuracy of the scales to insure proper billing to customers were required. Many types of equipment are necessary to serve the maintenance needs of the railroad. For my layout I am developing a small roster to represent some of the various types of equipment. Most maintenance equipment, particularly snow plows, small capacity hoists and flangers, was older equipment that was originally assigned different number series. Between 1930 to 1948 most equipment was re-numbered into a less complex classification. In most cases the New Haven used cabooses from revenue for Work or Wreck Trains but at least one caboose soldiered on in use on a Tool Train and was restricted from revenue use for several reasons, one of which was that it remained equipped with "K" type brake gear, not being updated to "AB" type gear. While the history of the New Haven Class NE cabooses is described in my "Cabeese" page, since this car ended life assigned to the Maybrook Tool Train, the stoy of the model appears in more detail here. C-118 was built from a Funaro and Camerlngo resin kit originally produced for NHRHTA and is still available from F&C as Kit 508. When I started this model I decided to detail the car as much as I possible, so in addition to the underbody detail (supplied with the kit), I scratch-built an interior. The above photo on the left shows the interior walls, toolbox and steps, plus components like bunks, lockers and conductors' desk. The photo to the right shows the scratch-built parts (including a wash basin) in place as well as a commercial cast metal pot-bellied stove. The above photos show a little more of the interior layout. The window "glass" was made from clear sheet styrene and was sandwiched between the exterior walls and the interior walls during construction. Overall I am pleased with how this model turned out. While I will not be building the entire Maybrook Tool Train, Diner W-153 (built from a Roundhouse Pullman Palace kit) is on my project list. My model of L-64 uses an old Tyco tender I picked up at a train show for $3.00. The proportions and dimensions are within inches of a prototype New Haven tender. I swapped out the trucks for some Tichy caboose trucks which have the correct springs and wheel base but I’m not sure about the journal boxes. These look a bit small to me compared to photos. I added a curved section and bracing made from sheet styrene to the coal pocket slope sheet to come closer to the New Haven design. I also applied Tichy brake wheel and ratchet detail and used Precision Scale brass ladder stock to detail the rear of the tender matching available photos. The back-up light was made from the post section of a Kadee coupler box part. The brake wheel rod and electrical conduit for the back-up light are 0.008” diameter phosphor bronze wire from Tichy. A small circle of 0.005” sheet styrene was cemented into the post hole and painted silver to resemble the reflector in the light housing. Microscale Kristal Kleer was applied to create the headlight lens. The coal load was painted Oily Black for now, but at some future date I will use Woodland Scenics coal to build a more appropriate coal heap shape. The rest of the tender is painted Testors Guard Red , the same color I used for Maybrook Tool Train caboose C-118. and flat black. Decals are from Microscale set 87-1199 except the set does not come with an “L” so I performed surgery on the letter “T” to make the correct letter. After decaling but before applying the headlight lens the entire model was sprayed with a clear flat finish. The New Haven rostered a variety of hoists ("H"-designation), cranes (typically self-propelled crawler cranes; "CC"-designation) and high-capacity derricks ("D"-designation) which were used for a variety of purposes. Hoists and cranes from 3-ton to 40-ton lifting capacity served many uses from lifting wheelsets or trucks to load flat cars or to load or unload new track components (ties, rail, etc) or the boom could be transformed from a hook, to pile driver to clamshell bucket with the use of accessory attachments. From circa 1922 the New Haven owned several 3-ton kerosene motor-driven hoists built by Brownhoist and numbered H-30, H-32, H-35 and H37 through H-39. About 1920 the New Haven acquired a few 15-ton capacity models from Brownhoist numbered H-12 and H-15. The New Haven also owned a 25-ton capacity gas locomotive crane numbered H-47. This was built by the American Hoist and Derrick Company in 1940, and the trucks were equipped with a self-propelling drive. Between 1942-4 the New Haven acquired additional 25-ton capacity hoists from the same manufactuer. These were numbered H-49 through H-57. During 1941 the New Haven also purchased two 40-ton capacity hoists from the same manufacturer which were also self-propelled. These were numbered H-46 and H-48. The New Haven owned two additional 25-ton capacity steam locomotive cranes which were built by Industrial Brownhoist in 1927. Originally these were numbered 516079 and 516080 but in 1930 they were renumbered to H-3 and H-4. For my roster, I've chosen to model H-3. My model of H-3 started out as an old Life-Like brand crane. For this model I lowered the roof, reduced the height of the spool mechanism that projects through the roof supporting the boom cables, modified the front of the cab to more closely follow the prototype, filled in side windows and added some strip styrene to the boom as reinforcing plates. 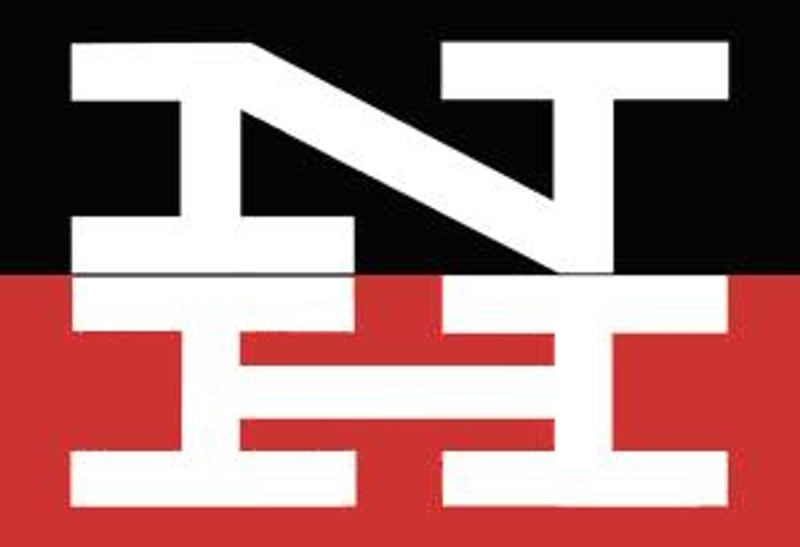 Decals are a combination of Highball Graphics New Haven MOW and old Walthers HO scale decals (Freight Car and MOW Cars). In addition to the cranes and hoists with up to 40-tons capacity, the New Haven owned several derricks with heavy lifting capacity from 150 to 230 tons. Typically the "Big Hook" was only called out for wreck train service, although they could be used for general lifting when necessary. The New Haven converted several steam-powered derricks to diesel power in the 1950's. 150-ton capacity derrick D-3 was converted in September 1955. Additional 150-ton cpacity derricks D-4, D-5 and D-6 were converted December 1952, March 1954 and September 1954 respectively. The highest capacity derricks were the three 230-ton cranes built in 1944 by Industrial Brownhoist. These derricks were stationed at Terminals, and bore the name of the terminal location on the boom; D-100 was assigned to New Haven, CT; D-101 to Providence, RI and D-102 to Oak Point, NY. My model of D-102 is a stand-in quality representation. Over the past few decades brass models have been offered on occasion, and many years ago Red Ball produced a cast-metal kit. I started with an Athearn 250-ton Bucyrus derrick. Several years ago I changed the Buckeye trucks to metal versions with insulated wheelsets. The lights that are positioned atop the roof and the underside of the boom contain grain-of-rice light bulbs that are wired to the trucks. The unit needs a good (electrical) tuning and I have yet to check the bulbs for operation since I unpacked the unit. Although it appears the large wreck cranes were painted black by 1959, I chose to paint the body of mine Hunter Green. The boom, frame, trucks and roof are black. The lettering is a combination of old Walthers (Freight Car) and Highball Graphics (New Haven MOW equipment). The New Haven, as many railroads, had track scales located along the system. Scales were (and still are) necessary to verify that high-volumne commodoties that are priced by weight (particularly coal) are measured accurately for accounting and billing purposes. In order to ensure the accuracy of such weights, track scales were checked for calibration at regular intervals. In order to perform this task, the New Haven owned pieces of equipment called scale test cars. Car M-23 was a cast steel car built by Lake Erie Engineering Corporation in 1940. My model is from an old (out of production) Stewart Products kit that I assembled in September 2008. This particular piece of equipment has a gloss finish because these cars were kept in very good shape for the task. Assembly was a bit challenging since the journals are individually sprung and actually work. The drooping couplers may be replaced by dummy couplers as the fit is very poor. Lettering is a combination of Highball Graphics MOW and old Walthers New Haven Cab Unit Diesel (Warm Orange and Green scheme). The black "M"'s on the silver-painted ends are made by working from magic with letters "H" and "V" since I did not have a black "M" in any decal sets. The New Haven had several types of snow fighting equipment at their disposal. Many snow plows were built by the Russell Snow Plow Company between 1920-1930. The plows were designed in two versions; single-track plows were identified by the centered and symmetrical "knife-edge" type blade. Double-track plows had the blade skewed to one side rather than centered. This forced the snow off to the outside of the tracks to avoid building up drifts between two adjacent tracks. Snow Plow S-6 was a single-track plow with wooden body built by the Russell Company originally delivered to the New Haven in January 1921 numbered 514005. In 1930 it was renumbered as S-6. The Shoreliner Volume 10 Issue 1 (1979) article states that many of the early New Haven plows were retired in the 1930’s with the majority retired in 1939. However, there is a December 16, 1956 photo of S-6 published and the May 15, 1956 Equipment Assignment lists S-6 assigned to Providence. I have a May 31, 1959 Summary of Equipment that lists five snow plows, but the Summary does not give specifics about which plows were still in service. 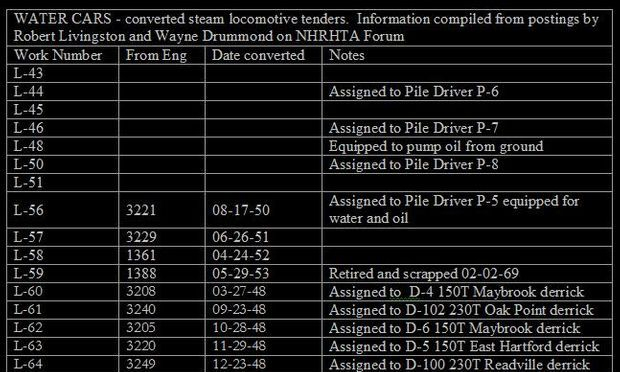 I suspect S-6 was not meant to be included in the list of equipment retired by 1939 in the Shoreliner article. The model was built by Al Lawrence many years ago and is an Ambroid kit, long out of production. Northeastern Scale Models also makes a similar kit which is currently available. 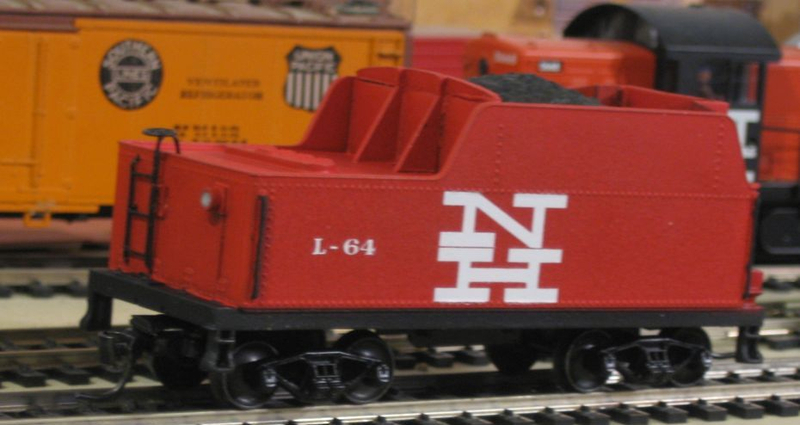 I will update the lettering on the car to include the car number and script herald using the Microscale New Haven MOW decal set in addition to adding a Custom Finishing front coupler support. I may also add the turnbuckle truss braces to the wing blades and cupola shown in prototype photos. Snow Plow S17 was a single-track steel-bodied plow delivered from the Russell Company in March 1942. The model is modified from a Walthers Russell Snow Plow kit to more closely resemble the prototype that not only served on the New Haven, but continued in service in the state of Maine at least through 2005! This model has paneled doors, modified elevator (wing) plows with turnbuckles and support wires added. Custom Finishing front coupler pocket and Golden Glow headlight details were added, and the kit-supplied AB brake gear was changed to Tichy Group KC type. Window glass, modified roofwalks and the front air line details were also added. Lettering is a combination of Walthers NH Freight Car and Highball Graphics MOW decals. Flangers could be and often were used for removal of light snow between rails. These cars were equipped with a double-sided blade mounted midway along the length of the carbody. The blade could be raised in order to clear grade crossings. The need to do this was indicated by metal posts placed along the right of way. The New Haven owned a variety of flanger equipment. One of the largest groups was built by the New Haven in their East Hartford shops in 1928. Flanger S-60 was one of the group of plows built at the East Hartford shops. This is an old Empire Midland brass model which is still relatively easy to find at train shows and on-line auctions despite its age. The model is lettered with Microscale decals.